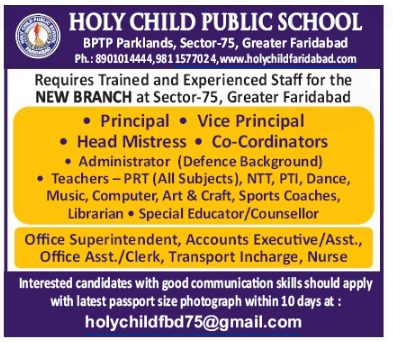 Holy Child Public School, Greater Faridabad has advertised for recruitment of Teachers PRT / NTT jobs vacancies. Interested and eligible job aspirants are requested to apply within 10 days from 04th December 2018. Check out further more details below. About School: Holy Child Public School is a co-educational English Medium Public School and provides education to all age group children from Pre-Nursery to Class XII. The school was established in 1976 and is managed by Holy Child Educational Society (Regd.) comprising of eminent persons from all walks of life who have vision and commitment in the field of education under the able chairmanship of Capt. R.K. Bhatia. It is affiliated to the Central Board of Secondary Education (CBSE) and follows the national syllabus as approved by the National Council Of Education, Research and Training (NCERT). How to Apply: Interested and eligible candidates are requested to send CV along with one set of all copies of certificates / testimonials and recent PP size photos to the email address provided here.